New York, New York—the city that never sleeps. Even here, too many of our officials still haven’t woken up to the reality of our global ecology. They don’t seem to realize that the decisions we make affect people half-way around the world—in fact, they affect nothing less than the world. We need to remind these elected officials and agency heads that when they purchase tropical wood with our tax dollars, they’re sabotaging our future. It’s going to take a little public pressure, a little people power, but we can stop tropical wood imports to New York City. We can live in a city that instead builds with sustainable materials. You can make a powerful difference: please take a moment to contact one or more of our elected officials or agency heads. You’ve probably heard this kind of request before, but did you know that U.S. Congressional Representatives count each letter that they receive as if it voiced the political convictions of ten people? Since we live in a city that never shuts up, we’re guessing those figures are slightly less for the letters and rants that are sent to our City Council members and State Legislators. Still, the point remains: you’re voice counts, maybe more than you ever guessed. If our leaders know we’re watching, if they see that we’ve exposed issues that too many of them would still rather not speak about, then they’re going to have to react and reconsider. In the face of our public demand, they will change. 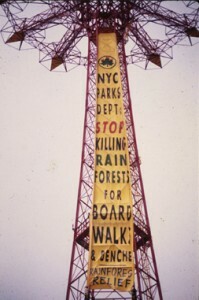 In 2008, Mayor Bloomberg launched his “Tropical Hardwoods Reduction Plan”, which promised to reduce NYC’s consumption of rainforest wood immediately. But the truth is, New York City is actually doubling tropical wood imports for the foreseeable future. For some reason, Mayor Bloomberg’s plan doesn’t count the enormous tropical wood imports for three (still not-yet built) new marine transfer stations, the up-coming Staten Island Ferry terminal dock renovations and the Hudson River Park Trust’s waterfront renovations along 50+ blocks. Please contact the Mayor and tell him that you know his Tropical Hardwood Reduction Plan isn’t yet doing the job of protecting rainforests or reducing climate change. Please contact the State Legislature and tell them that they must ban the use of ALL tropical hardwoods in city- and state-sponsored projects. Here is a list of some of the city agencies and public-private trusts—including NYC DOT, the Department of Sanitation and Hudson River Park Trust—that use tropical hardwoods. Please take the time to tell one or more of them to invest in the future. 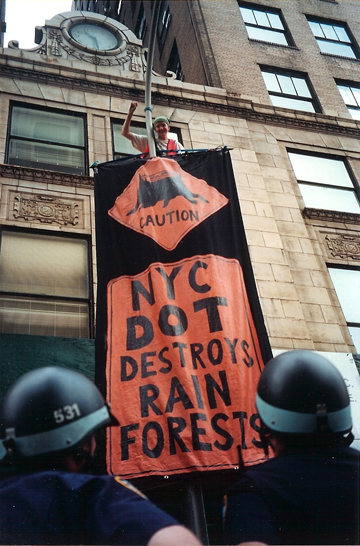 If you’re interested in working on stopping the imports of tropical woods to NYC and promoting the use of alternative materials for infrastructural building, we’d love to meet you. 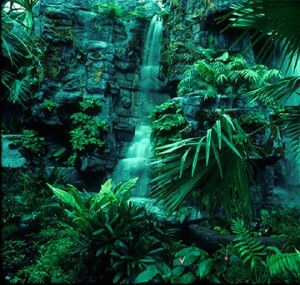 Please send us an email: rainforestsny@gmail.com.